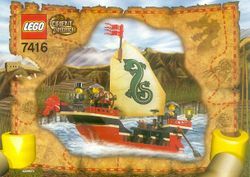 7416 Emperor's Ship is an Orient Expedition set released in 2003. It includes a one-masted junk manned by two Dragon Fortress Guards and Lord Sam Sinister. It contains 177 pieces in total. The set is armed with two crossbows mounted on a rotatable rack. The set also includes a musket. Behind the mast is a hatch that leads into a cargo hold where two barrels are stored. They are filled with four jewels (red, yellow, green and blue) in total. In the front of the ship is a red dragon helmet to symbolise that the ship is owned by Chang Wu. At the rear of the boat is a lantern and two steering oars. The included sail piece with the Dragon Fortress symbol on it appeared only in this set. The Emperor's ship came with 3 playing cards, them being a challenge (the ship), and two items (a rifle and a navigational instrument). After Chang Wu became partnered to Lord Sam Sinister, they used this to survey around the Dragon Fortress. Both wanted to eliminate Johnny Thunder before he got to the treasure of Marco Polo, so they used the Ship. A day after Johnny Thunder, Dr. Kilroy, and Pippin Reed met Jing Lee, the four snuck on board as cargo to make their way to the Dragon Fortress and get the Marco Polo's Golden Dragon before Lord Sinister could. This is a description taken from LEGO.com. Please do not modify it. (visit this item's product page) Set your sails for danger! Lord Sinister is in command of this powerful ship of the Chinese Emperor! He's using it to keep an eye out for Johnny Thunder and his friends and stop them from finding the treasure of the Marco Polo. With its fierce crew on guard, Johnny will have a hard time sneaking past the ship and getting to the Emperor's fortress! Includes Johnny Thunder Orient Expedition game cards. Facts about "7416 Emperor's Ship"
ShopDescription Set your sails for danger! Set your sails for danger! This page was last edited on 28 April 2016, at 18:22.